Khan spoke at the Institute of Politics about what pushed him to speak out against President Trump. 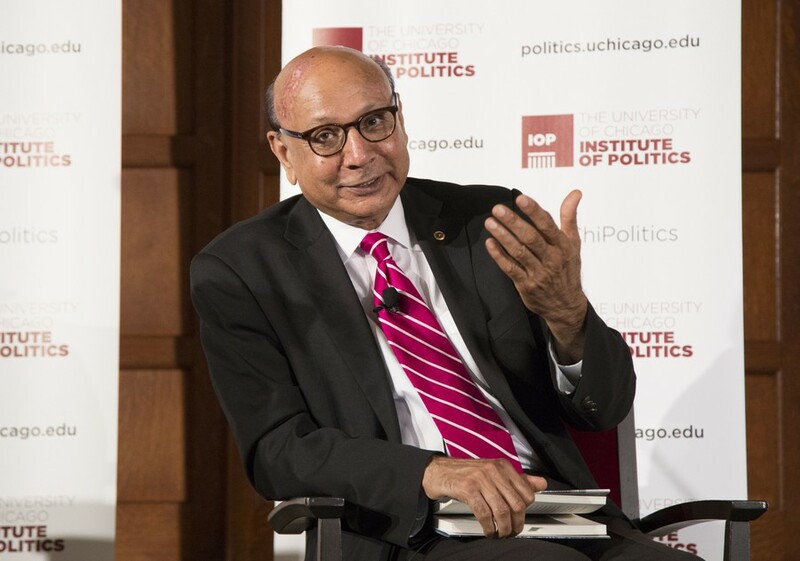 On Thursday, October 11, Gold Star father and lawyer Khizr Khan pulled out his pocket constitution, as he is known to do, during a Speaker Series event held by the Institute of Politics, moderated by reporter Odette Yousef of WBEZ. Khan discussed his disappointment with the current state of American immigration politics and his hopes for the future. He began by describing the events that led up to his speech at the Democratic National Convention in 2016. Around the time that Hillary Clinton asked him to speak at the DNC, children of immigrants in Khan’s community flooded to his door, asking for legal advice. They were afraid of being deported, he said. Khan was hesitant of speaking at the convention, afraid of the criticism he would attract. But after reading the letter, his wife insisted that they must attend the convention and speak on behalf of the children. “I sat down and wrote my speech thinking of those kids. One page, two page, and by bed time, I had written 18 pages,” Khan said with a laugh. The speech was only meant to be two minutes long. When asked about the present political climate towards immigrants—specifically the Donald Trump administration’s travel ban on several Middle Eastern countries, curved intake of refugees, and separation of families—Khan expressed an unexpected optimism and faith in America’s future. “On the day of the decision [regarding the travel ban], I still was heartened for one reason: rule of law prevailed. We did not win, but rule of law prevailed that we knock at the door of the Supreme Court, and the Supreme Court heard us. They did not agree with us, but they heard us,” he said. Khan takes on a unique view in response to today’s immigration policies. In his eyes, America has always been a “beacon of hope” that supports those who are forced to leave their countries and are searching for a new home. He believes the setbacks against the community are temporary. Referencing the Dred Scott and Korematsu cases, Khan explained that minorities have been antagonized in the past, but the damage has been alleviated since. When an audience member asked Khan if he thinks the damage done to immigration rights can be fixed, Khan responded by calling on people to head to the polls and work together.